Update – Aug. 17, 2017: Two new lessons ("Measuring Solar Energy During an Eclipse" and "Modeling the Earth-Moon System") were added to the Teach It section below. This month marks the first time in 38 years that one of nature’s most awe-inspiring sights, a total solar eclipse, will be visible from the continental United States. And unlike the 1979 eclipse, the one on August 21 can be seen from coast to coast – something that hasn’t happened since 1918. 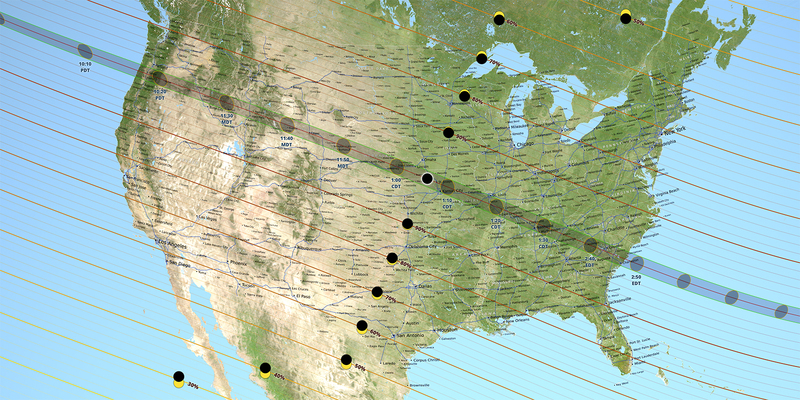 Millions of people are expected to travel to the 14 states that are in the path of totality – where the Moon will completely cover the disk of the Sun – while hundreds of millions more in every other state of the U.S. will be able to see a partial eclipse. Whether you live in or are traveling to the path of totality, or will be able to step outside and view the partial eclipse from the comfort of your own home or school, the eclipse provides both an inspiring reason to look to the sky and opportunities to engage in scientific observations and discovery. 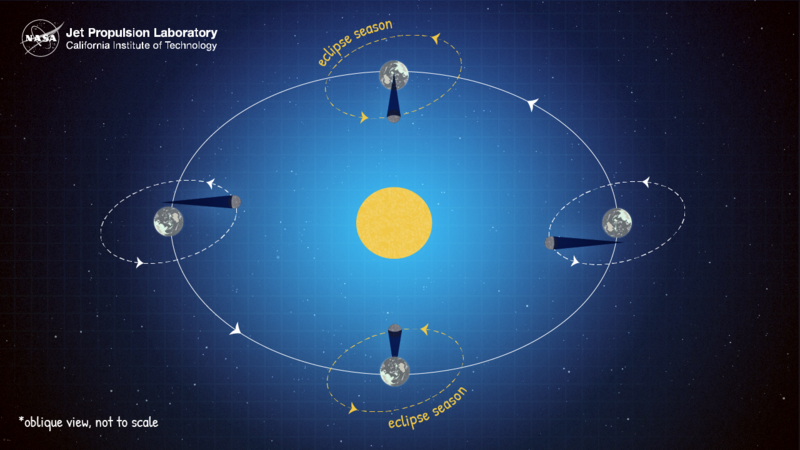 Use these standards-aligned lessons and related activities to get your students excited about the eclipse and the science that will be conducted during the eclipse. Eclipses occur as the result of an alignment between the Sun, the Moon and Earth. Solar eclipses can only happen during the new moon phase, when the Moon’s orbit brings it between Earth and the Sun. 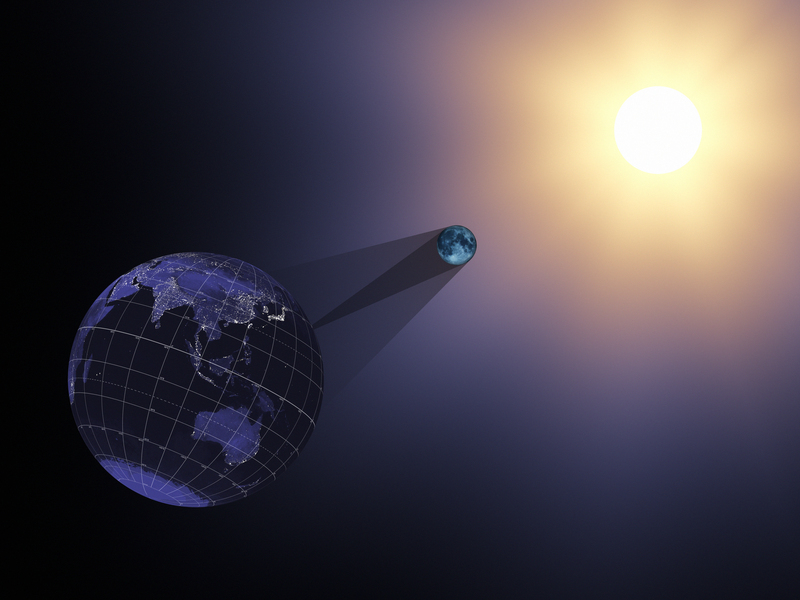 At this time, the shadow cast by the moon could land on Earth, resulting in an eclipse. But most of the time, because the moon’s orbit is slightly titled, the moon’s shadow falls above or below Earth. The time period when the Moon, Earth and the Sun are lined up and on the same plane is called an eclipse season. Eclipse seasons last about 34 days and occur just shy of every six months. A new moon during an eclipse season will cause the Moon’s shadow to fall on Earth, creating a solar eclipse. In addition to the proper alignment required for an eclipse, the distance between Earth, the Moon and the Sun also plays an important role. Even though the Moon is much smaller than the Sun (about 400 times smaller in diameter), the Sun and Moon appear about the same size from Earth because the Sun is about 400 times farther away than the Moon. If the Moon were farther from Earth, it would appear smaller and not cover the disk of the Sun. Similarly, if the Sun were closer to Earth, it would appear larger and the Moon would not completely cover it. Total solar eclipses provide a unique opportunity for scientists to study the Sun and Earth from land, air and space, and allow the public to engage in citizen science! On a typical day, the bright surface of the Sun, called the photosphere, is the only part of the Sun we can see. 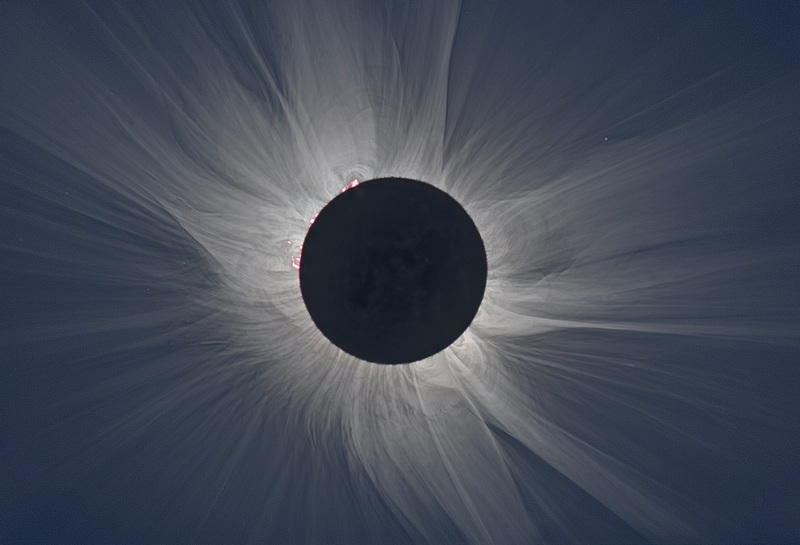 During a total solar eclipse, the photosphere is completely blocked by the Moon, leaving the outer atmosphere of the Sun (corona) and the thin lower atmosphere (chromosphere) visible. Studying these regions of the Sun’s atmosphere can help scientists understand solar radiation, why the corona is hotter than the photosphere, and the process by which the Sun sends a steady stream of material and radiation into space. Citizen scientists can get involved in collecting data and participating in the scientific process, too, through NASA’s Global Learning and Observations to Benefit the Environment, or GLOBE, program. During the eclipse, citizen scientists in the path of totality and in partial eclipse areas can measure temperature and cloud cover data and report it using the GLOBE Observer app to help further the study of how eclipses affect Earth’s atmosphere. You can learn more about the many ways scientists are using the eclipse to improve their understanding of Earth, the Moon and the Sun here. Important! Do not look directly at the Sun or view the partial eclipse without certified eclipse glasses or a solar filter. For more information on safe eclipse viewing, visit the NASA Eclipse website. When following proper safety guidelines, witnessing an eclipse is an unparalleled experience. Many “eclipse chasers” have been known to travel the world to see total eclipses. The start time of the partial eclipse, when the edge of the Moon first crosses in front of the disk of the Sun, will depend on your location. You can click on your location in this interactive eclipse map to create a pin, which will show you the start and end time for the eclipse in Universal Time. (To convert from Universal Time to your local time, subtract four hours for EDT, five hours for CDT, six hours for MDT, or seven hours for PDT.) Clicking on your location pin will also show you the percent of Sun that will be eclipsed in your area if you’re outside the path of totality. If you are inside the approximately 70-mile-wide strip known as the path of totality, where the shadow of the Moon, or umbra, will fall on Earth, the total eclipse will be visible starting about an hour to 1.5 hours after the partial eclipse begins. Only when the eclipse is at totality – and the viewer is in the path of totality – can eclipse glasses be removed. Look at the eclipse for anywhere from a few seconds to more than 2.5 minutes to see the Sun’s corona and chromosphere, as well as the darkened near side of the Moon facing Earth. As before, your viewing location during the eclipse will determine how long you can see the eclipse in totality. After totality ends, a partial eclipse will continue for an hour to 1.5 hours, ending when the edge of the Moon moves off of the disk of the Sun. Remember, wear eclipse glasses or use a pinhole camera for the entirety of the partial eclipse. Do not directly view the partial eclipse. 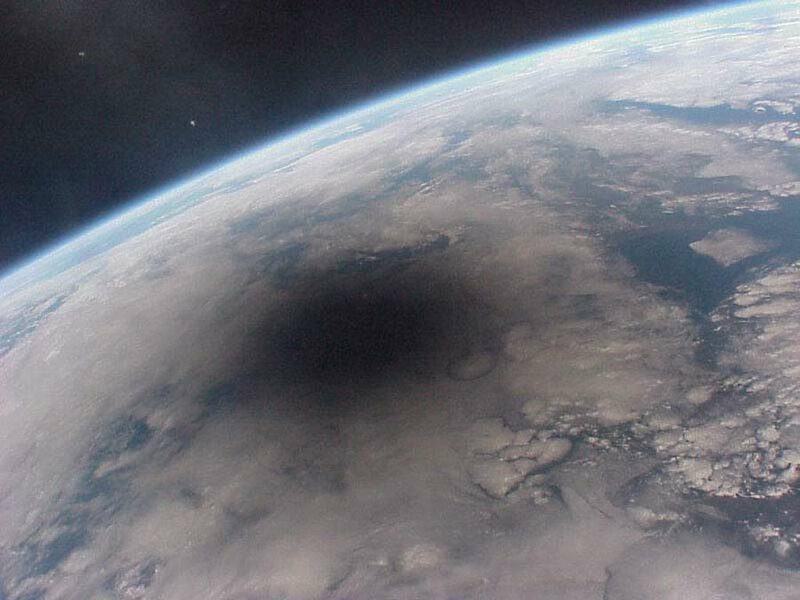 Find out how to make your very own pinhole camera to safely view the eclipse in action. To get an idea of what the eclipse will look like from your location and explore the positions of the Moon, Sun and Earth throughout the eclipse, see this interactive simulation. For more information about the start of the partial eclipse, the start and duration of totality, and the percentage of the Sun eclipsed outside the path of totality, find your location on this interactive eclipse map. NASA Television will host a live broadcast beginning at 9 a.m. PDT on Aug. 21 showing the path of totality and featuring views from agency research aircraft, high-altitude balloons, satellites and specially-modified telescopes. Find out how and where to watch, here. Epic Eclipse – Students use the mathematical constant pi to approximate the area of land covered by the Moon’s shadow during the eclipse. Pinhole Camera – Learn how to make your very own pinhole camera to safely see a solar eclipse in action from anywhere the eclipse is visible, partial or full! Moon Phases - Students learn about the phases of the Moon by acting them out. In 30 minutes, they will act out one complete, 30-day, Moon cycle. NEW! Measuring Solar Energy During an Eclipse – Students use mobile devices to measure the impact a solar eclipse has on the energy received at Earth’s surface. NEW! Modeling the Earth-Moon System – Students learn about scale models and distance by creating a classroom-size Earth-Moon system. NASA GLOBE Observer – Students can become citizen scientists and collect data for NASA’s GLOBE Program using this app available for iOS and Android devices (eclipse update available starting August 18, 2017).